Erik Burnham manages to take (mostly) all new characters and make them into a brand new team of Ghostbusters with the same spirit (no pun intended) of the old team. Yes, they are TOTALLY different than the old team, but they still have humor, heart, and most of all, a lot of fun. 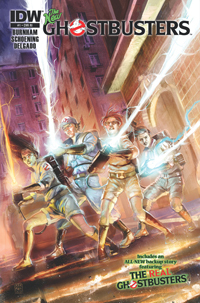 Burnham pulls some VERY cool surprises out of thin air, like how the NYC brass deal with this new group of Ghostbusters, what they are doing to find and rescue Ray, Peter, Egon, and Winston, and also how they deal with the Ghostbusters perpetual pain in the neck, Walter Peck. It’s new, bold, refreshing, and yet familiar. 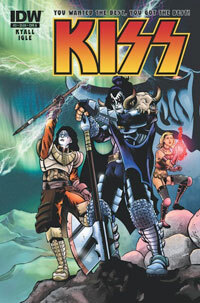 KISS #4 features the epic conclusion to the World Without Heroes story arc, and when IDW says epic they mean EPIC!!! It’s everything you want it to be and just a little bit more. To sum up, in this story arc, we basically have KISS barbarians, which in and of itself, is pretty freakin’ cool. What makes it even MORE awesome is that writer Tom Waltz does a fantastic job telling the story! 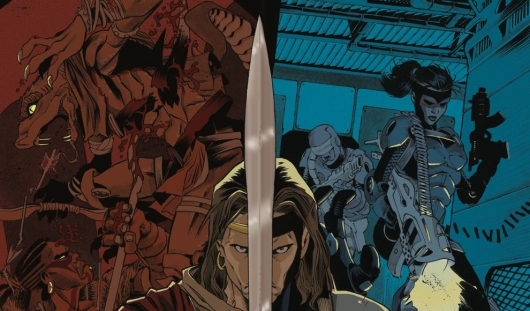 In just a few issues, he’s given the four “civilian identities” a LOT of character for the reader to absorb. Not too much, though, that it draws awesome from the KISS warriors. We get a little more of the Destroyer and Elder, and more of She, but the meat of the story is KISS’ battle with an out of control dragon and trying to save their village and their world. 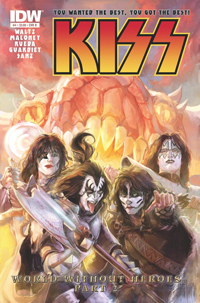 KISS #3 is another AMAZING issue from the folks at IDW!!! The great thing about this book is that it’s a different title almost every month. You’re not sure where you’re going to end up when you pick up an issue. This issue is fantastic for a number of reasons, but most of all, because it’s a total 180 from the first two issues. Tom Waltz get handed the reins for this arc, and first off let me say, if you’re not reading his Teenage Mutant Ninja Turtles title, you’re really missing out. That aside, his inaugural issue of KISS brings a totally different vibe than the first two issues, and that’s one of the great things. The other great things — KISS BARBARIANS!! !